This letter was written by Pvt. 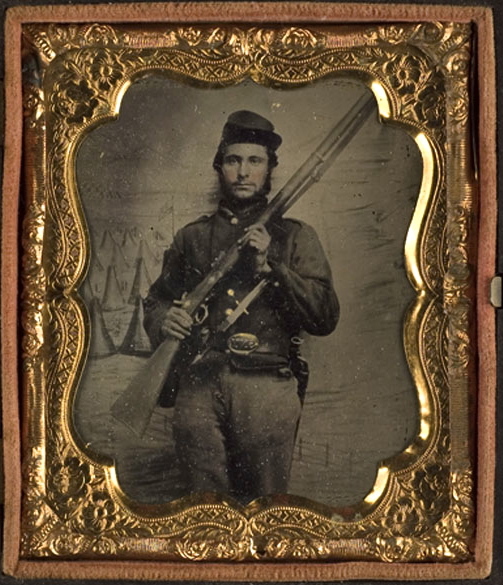 Daniel Webster Spofford (1835-1924) of Company A, 19th Massachusetts Infantry. He was the son of Capt. Aaron Spofford (1792-1879) and Rebecca Betsey Foster (1797-1879) of Boxford, Essex County, Massachusetts. Daniel wrote the letter from Camp Benton about a month after participating in the Battle at Ball’s Bluff, Virginia. 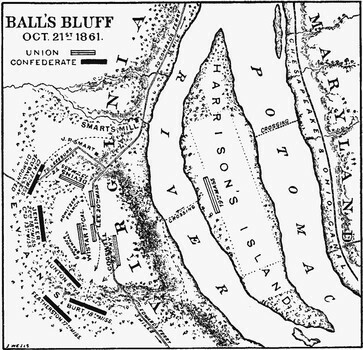 It was at Ball’s Bluff that Confederate General “Shank” Evans stopped a badly coordinated attempt by Union forces to cross the Potomac at Harrison’s Island and capture Leesburg, Virginia. Seven hundred federal troops were captured by the Confederates when they conducted a timely counterattack, driving the Federals over the bluff and into the river. Pvt. Spofford would survive the war but he was wounded in the leg at the Battle of Antietam on the morning of 17 September 1862 while advancing under “Bull” Sumner’s command through the carnage of the Miller cornfield and into the West Woods by the Hagerstown Pike. He learned afterward that his brother, Phineas Foster Spofford (1825-1902) — a Confederate officer in the 8th South Carolina Infantry — also fought on that bloody day in Maryland. The 8th South Carolina was brigaded with Joseph Kershaw’s South Carolinians which saw desperate fighting near the Dunkard Church by the West Woods in the same hour. Unaware of each other’s presence on the battlefield until afterwards, the two brothers fought for their lives on opposing sides within a few hundred yards of each other. 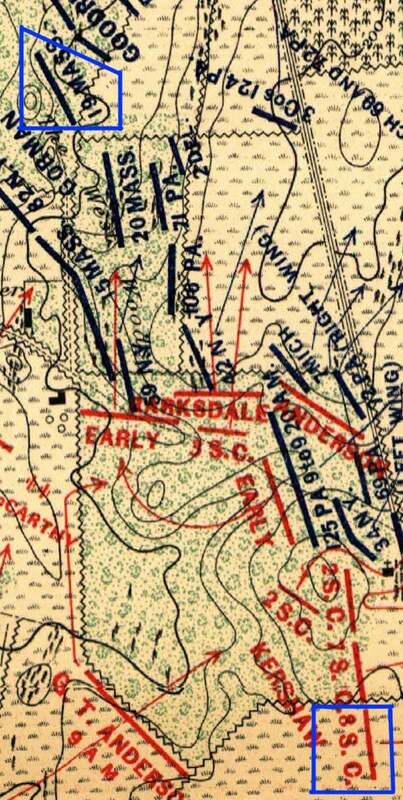 A map of the West Woods on Antietam Battlefield showing the locations (blue boxes) of the 19th Mass. & the 8th S.C. It should be noted that the Spofford brothers had a third brother who also served in the Civil War. Aaron Spofford (1833-1862) was in Company E, 12th Massachusetts and was killed at the Second Battle of Bull Run on 30 August 1862. As stated previously, Pvt. Daniel Spofford survived the war and resided in Georgetown, Massachusetts. He married Eliza Ann Folsom, the daughter of James and Dolly Folsom, in October 1865. He married second, Elizabeth Lavender Gynan Dore in 1909. Whether Pvt. 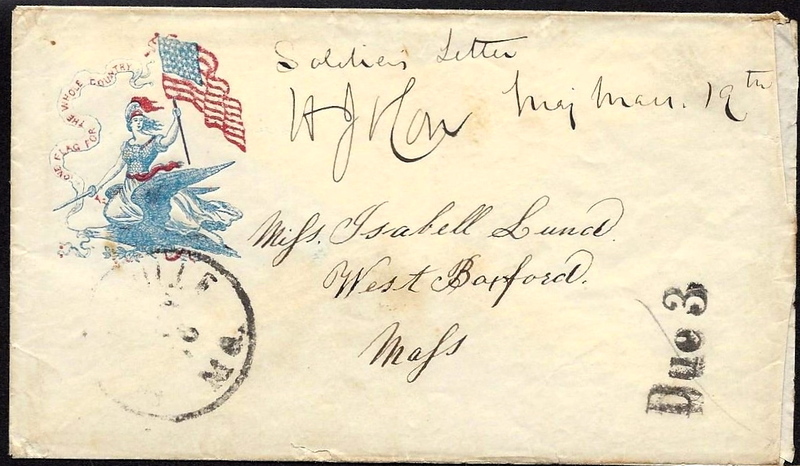 Spofford and the recipient of this letter, Mary Isabella Lund (1834-1865), were sweethearts isn’t clear from this letter or from public records. An obelisk in the Brookside Cemetery at West Boxford indicates that she died in 1865. She was the daughter of William and Mary Isabella (Reynolds) Lund. Your letter with [cousin] Lottie’s [Charlotte Matilda Reynolds] and [sister] Tilly’s [Matilda Barker Lund] and the envelopes and paper came safe to hand and you may be assured it was received with the greatest pleasure and many thanks to you all for the letter and paper. I hope you will not send me any more paper — only that which is pretty well covered with writing as it is the most acceptable of anything I can get in the shape of reading and I am so situated that I can get paper now. I am saving that paper to write you and Tilly my best letters on. As I wrote to Lizzie, I think this must be rather dry. There has been some talk of our going on some secret expedition but I do not believe we shall leave this place at present. I do not know what Government means to do with us but I am perfectly resigned to my fate knowing that if Government should fail to provide for us, there is one higher who noteth even the fall of the sparrows and I know He will not be unmindful of us. We have to drill most all the time so it breaks up my time for writing. We can see the Blue Ridge peering up over the woods and I think you would think it was a great cloud for I did the first time I saw it. It is very dark blue. This entry was posted on Wednesday, April 2nd, 2014 at 2:30 pm	and posted in Uncategorized. You can follow any responses to this entry through the RSS 2.0 feed. I have just discovered your blog and just love it! This letter was actually written to my first cousin, four times removed (had to work that out!). I can add some details to the individuals mentioned in this letter. The recipient, as you have noted, is Mary Isabella Lund, who died in 1865 of consumption. Lottie was Charlotte Matilda Reynolds and Tilly was Matilda Barker Lund. Lottie was Mary Isabella’s first cousin. Tilly was Mary Isabella’s sister. Mary Isabella Lund wrote her will in 1865 leaving bequests to both of these relatives. I believe the last line of the letter says “Do you hear from Ned and Hattie Raynolds?” I believe they are brother and sister, Edward Jackson Reynolds and Harriette Reynolds. Both are also first cousins of Mary Isabella Lund. Interestingly they were born in Honolulu to my third great grandfather, Stephen Reynolds, but their father sent them to Boxford at a very young age to be educated.